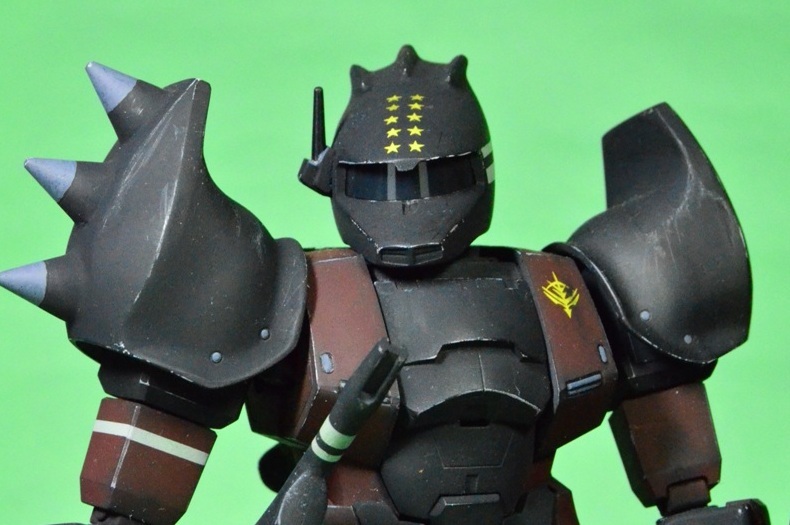 Here is another custom I did on my favorite monoeyed Mech the ZAKU. I did this simple build before for the yearly competition for our local modeling group : MECHAPINOY. This time around I used the ZAKU I as the base model for the simple modifications to make it look like a "light arms" guard utilizing only a heat rod that is usually seen with a DOM mech. To make it short........... TK07 don't have enough time before the competition to make a radical build or modifications this time around... LOL! Scratchbuilt heat rod / weapon mount. Shield mount / and modified the shield of Gelgoog to fit the ZAKU. Also made the Zeon Emblem from plaplate for the shield. Custom dark paint scheme and light weathering/dry brushing as to highlight the dark areas. and the shield emblem image: this area actually push the limit of my patience.... due to the curve nature of the shield, mounting the the emblem was quite a task to complete. Really impressed by your work! I build models casually, so I can appreciate the kind of effort you put in. Well done. Thanks man! Good luck on your future builds. Thanks dude. I've gotta ask how did you modify that shield? Majority of my works since I started in this hobby back in 2004 is with monoeye mechs and did not stop me from doing more.... Love those monoeyed walking beasts. This is where i will post all my previous works and works on progress, and a little bit more on the side.